Whose advancement is it, anyway? This sounds like a good idea. It would help get them to First Class faster and let them experience our high adventure trek. What do you think? A Scout is responsible for his own advancement, and his patrol leader should be aware of what the Scouts in his patrol need to do to advance. The Scouting experience revolves around the patrol, not the troop. The Scoutmaster works with the senior patrol leader, not the entire patrol leaders’ council. Working with the PLC is the SPL’s responsibility. Advancement in Boy Scouts, while important, is a method, not the desired end product. While First Class in the first year is a good goal, it’s important to know that every Scout advances at his own pace, and that advancement is not a goal or a purpose but rather a method that is used to achieve the aims of Scouting. It’s not a one-size-fits-all system where everyone proceeds in lockstep or anything close to it. Adults keeping track of which Scouts need which advancement items is more appropriate in Cub Scouts. (The Scoutmaster Handbook states that the troop scribe does this tracking – not the adults.) By the time a boy joins a troop he should be expected to keep track of his own advancement. He does not know this at first, which is where the troop guide can help explain it to the patrol leader and Scouts of the New-Scout patrol. Once they achieve Tenderfoot, they should have the hang of it and should be able to set goals to achieve the next ranks. To be sure, there’s nothing wrong with the Scoutmaster being aware that, say, most of the boys in the Rattlesnake patrol haven’t completed their second-class swim test, but it’s not his place to tell them that they should head to the pool next week to be tested. A gentle reminder to the SPL to check in with the Rattlesnakes’ patrol leader would be more appropriate. The other aspect of advancement is that it happens as a natural result of Scouting taking place. It’s not a checklist of things to be accomplished in order to receive a patch. In the process of belonging to and doing things with his patrol, a Scout will complete most of the requirements for advancement. 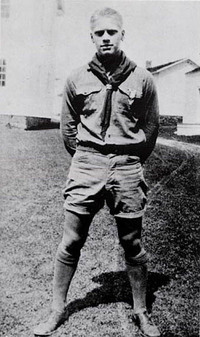 The patrol leader has the responsibility of knowing what the Scouts in his patrol need in order to advance, and should relate that to the patrol leaders’ council when planning troop activities. And there’s no reason a troop campout can’t be used by patrols individually to accomplish objectives that they wish to accomplish. (Just as a troop is a collection of patrols, a troop campout should be looked at as a collection of patrol campouts.) Unless it has a specific theme, such as attending a district camporee or hosting Webelos, the monthly campout is the perfect vehicle by which each patrol can plan and conduct its own activities leading toward advancement. For example, the new-Scout patrol needs practice cooking meals and identifying plants, while a regular patrol could enjoy an afternoon at the range working toward their Archery merit badge. They don’t all have to do the same thing, and it’s probably best that they don’t. It would be a mistake to consider going toward adult leadership having an active role in the things the boys should be doing for themselves. For those who came up through Cub Scout leadership, there is a tendency to look at Boy Scouts as “Webelos 3” and many have difficulty shaking the urge to take an active hand in management of the troop program. Certainly, adults managing and expediting advancement would get Scouts to advance more quickly, but our goal is not to see how many Scouts can earn ranks and how quickly they can do it. Sure, advancement is important, but it is mainly an indicator of how well our troop program is working, not the basis of it. Can I remind you that “those who came up through Cub Scout leadership” are usually the first ones to volunteer to help. Stop being dismissive of Cub Scout leaders. Thanks for the comment! And sorry if I painted with too broad a brush. Of course, I should have said “Cub leaders who have not trained for or who don’t otherwise understand the role of an adult in a Boy Scout troop“. There is a learning curve – a rather steep one for some – but many Scouters step into a troop role without knowing the way things are supposed to work, and often rely on their experience in Cub Scouts to guide their actions. Next PostNext How do I quell a parent revolt?